I just bought the Brother 5200 Dual Tray laser printer on Amazon! I already have another printer but for loan documents it needs to be both dual tray and laser (NOT inkjet!). You need dual tray so that you can print both legal and letter documents at the same time. The machine will detect what size paper is coming through and print accordingly. You need laser (and NOT inkjet) because laser imprints into the paper whereas inkjet runs the risk of smudging. The set up was fairly easy, that is until I needed to connect to the Wifi. Watch my YouTube video below to see me in action and find out if I ended up doing it myself! The printer itself cost me about $265 on Amazon (click here to view/buy). I have to say, this baby prints super fast! I have now moved the Brother printer into my office and use the other color printer occasionally (and when I need to scan something). It prints double-sided and is a great black and white printer for everyday use. The TN850 replacement toner cartridge costs $107 on Amazon (click here to view/buy) BUT that being said one cartridge prints 8,000 pages! That is less than 2 cents per page! 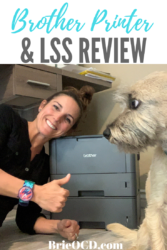 Moral of the story – if you are looking for a great monochrome laser printer, this is your go to unit! For all you aspiring notaries out there I recently took Mark Wills Loan Signing System course. It has a wealth of information and ongoing support. Click here for my referral link! If you are a notary, or thinking of becoming one, connect with me via email, [email protected], and we can chat about how to get you started. I have been a notary and signing agent for almost 14 years but it has been a hot minute since I have completed a loan doc signing. This course helped me to feel comfortable and get re-educated with the process. Mark also goes through each page of the loan documents and gives you cheat sheets so that you can refer back to them in a moments notice. It is very comprehensive and takes you through everything you need to know to complete a signing. Being a notary and certified signing agent gives you the freedom and flexibility to make your own schedule. I have enjoyed doing this for the past 14 years and will continue to do so! If you have any questions, please do not hesitate to reach out! Other Supplies (affiliate links) I use on the regular!